Ex USS Conolly (DD 979) destroyer, named after Admiral Richard Lansing Conolly was sunk as a target during the sinking exercise (SINKEX) of the multinational exercise UNITAS Gold on April 29. The warship was decommissioned on September 18, 1998 after 20 years of service. The annual UNITAS exercise series consists of two phases — Atlantic and Pacific. UNITAS Gold 2009 is being conducted as a single two-week exercise as the 50th performance of multinational partnership-building exercise. Along with U.S.Navy, 10 other participating countries are: Argentina, Brazil, Canada, Chile, Colombia, Ecuador, Germany, Mexico, Peru and Uruguay. 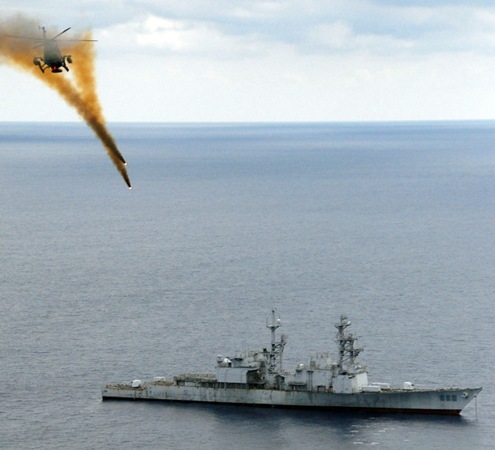 Warships from Mexico and Canada are participating in the exercise for the first time. The exercise provides an opportunity to conduct and assimilate joint and combined land, maritime, coastal and air-operations in a realistic training environment. The exercise includes live-fire exercises, undersea warfare, shipboard operations, maritime interdiction operations, air defense and surface warfare, amphibious operations, electronic warfare, and special warfare. The exercise started on April 20 and is expected to finish on May 7. At sea phase of the exercise commenced on April 23. Being held off the coast of Jacksonville, Florida. View more photographs from U.S.Navy. More details on ex-USS Connolly (DD 979) are at: Unofficial U.S.Navy Site. Read more about UNITAS Gold from U.S.Navy: Report 1, Report 2.